I got mine from normal Skittering Hollow. Inky also has the power of an awesome eyepatch! 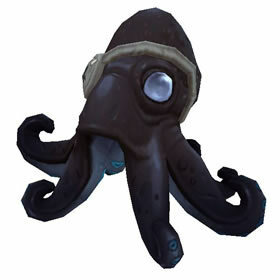 This lil one eyed pirate "octopus" dropped for me last night after a successful heroic run. This is actually the first IE pet I've had drop for me that I was excited to battle with. This guy has three mitigation choices in two slots, bubble looking really promising combined with dive or whirlpool. This guy has a lot of potential for synergy with other pets, and I'm really looking forward to finding some good combos. This pet dropped for me after completing Normal Un'Gol Ruins in the Victory screen. Whatever the story of his mysterious eyepatch is, he's not talking.